"I drew this after myself in front of a mirror in the year 1484 when I was a child." And the exhibit also features the famed drawings of his left hand, with the wooing gesture, the obscene gesture (he gives his viewer the finger) and a pointing gesture. When he paints Lucretia stabbing herself Durer emphasizes the hand that does the dirty work. He painted the hands of his patron the Holy Roman Emperor Maximilian and he painted an elderly man's aged veinous hand. 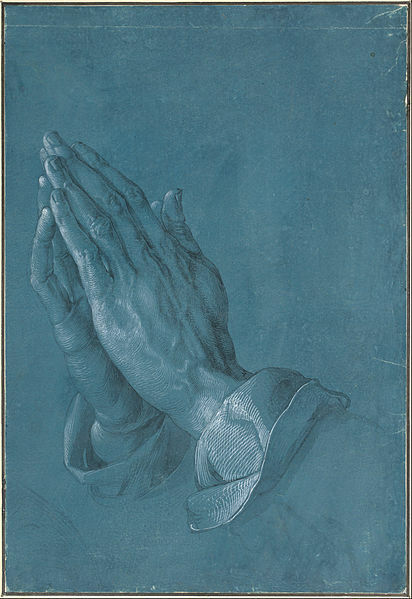 Hands obviously had great meaning for Durer who as the curators point out was the "German equivalent of Leonardo in Italy." But why do we admire Durer? His purported greatness is a part of the received wisdom of the ages and seeing the magnificent exhibition on display in Washington is a unique opportunity to think about his work. The series of engravings "Melencolia I," (1514), "Knight, Death and the Devil" (1513) and "Saint Jerome in His Study" might be said to have derived from the Durer's Bergman period such is the depth of their raw emotional power. The famed "The Great Piece of Turf" (1503) and "Wing of a Blue Roller" (1512) both demonstrate Durer's talent in the service of natural themes. "The Triumphal Chariot of Maximilian I" (1518) reveals the artist in both watercolor and technicolor. "The Visor for a Helmet," 1515-16, with its almost surrealist imagery is a dreamscape. The fact that he was the son of a goldsmith is usually offered as an explanation for the delicate and detailed craftmanships which characterizes his style. But technique alone cannot account for the power of Durer's work.